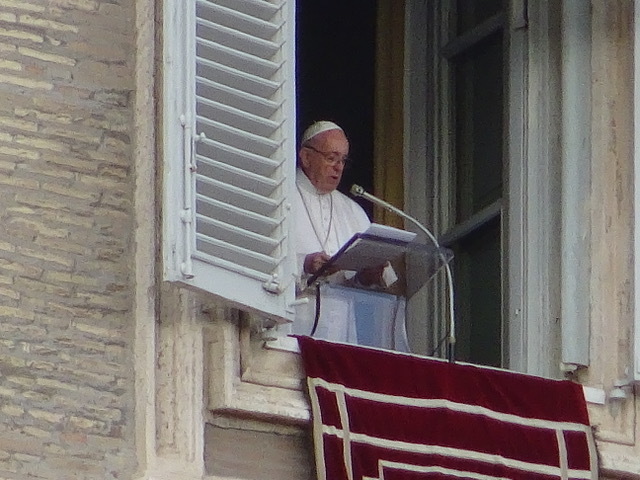 Every Sunday at noon is the Angelus Prayer, when Pope Francis speaks to those gathered in St. Peter’s Square. Today we are among the many who are here to see and hear the Pope. 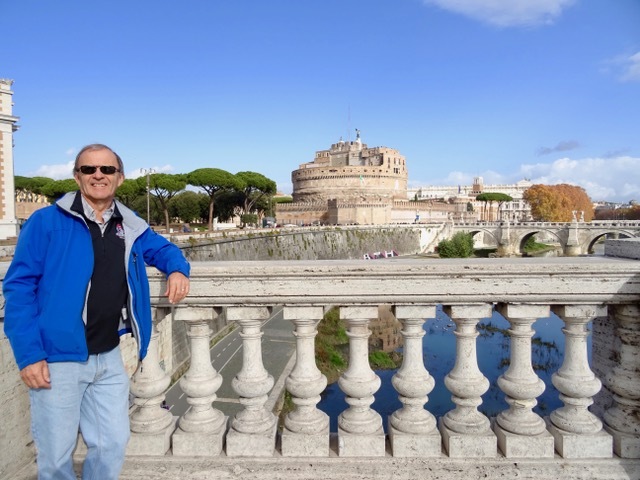 We thought we had a great spot right in front of St. Peter’s Basilica with a clear view of the central balcony…then Bob spotted something in the far away window of the building across the square. Oops, this is where the Pope appears, and we are quite far away. 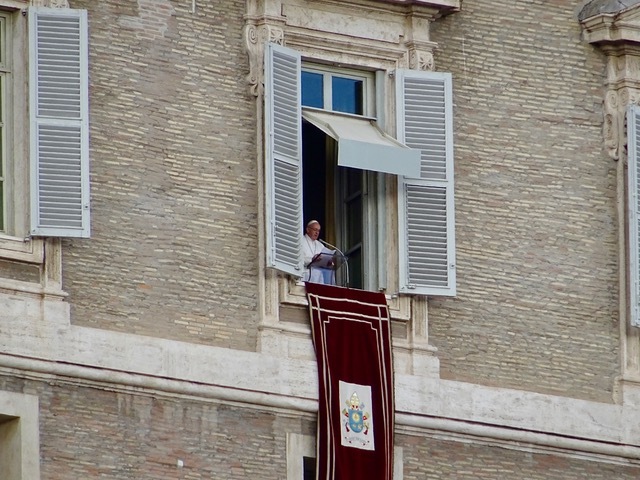 At noon the Pope appears and with a friendly wave and a welcoming “Buongiorno”, to which the crowd replies “Buonjourno”, he begins the Angelus Prayer. Good thing I have a telephoto zoom on my camera! 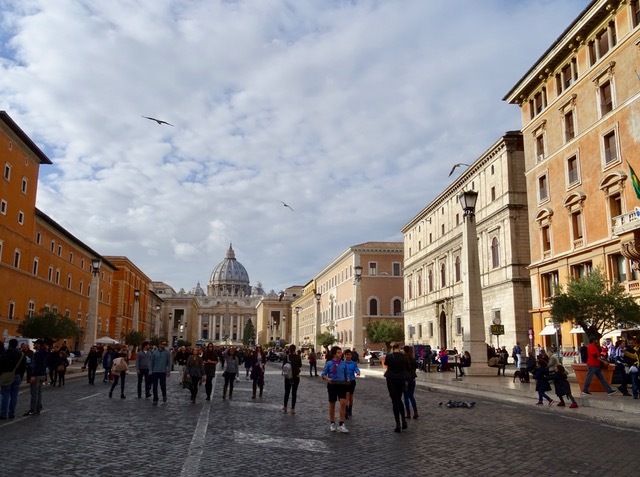 The Angelus ends with a blessing for everyone in the square and the blessing includes any religious objects that people have brought with them. The bells of St. Peter’s chime as the crowds begin to disperse. We have seen the Pope! 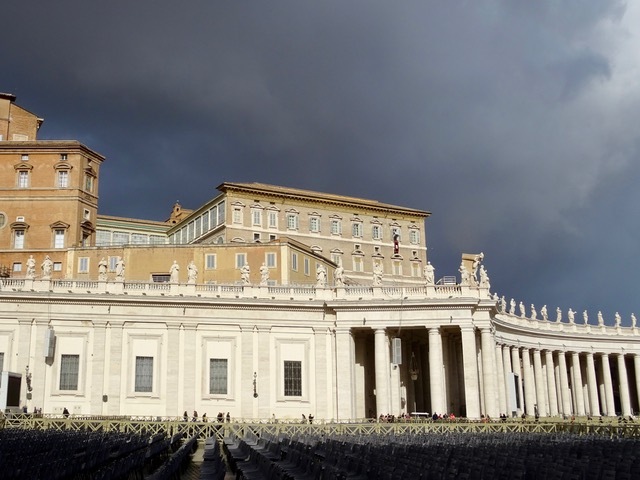 Although the clouds were dark and threatening while we were waiting to see the Pope, by the time the Angelus is finished the sun is peeking through the clouds so we decide to stroll about. 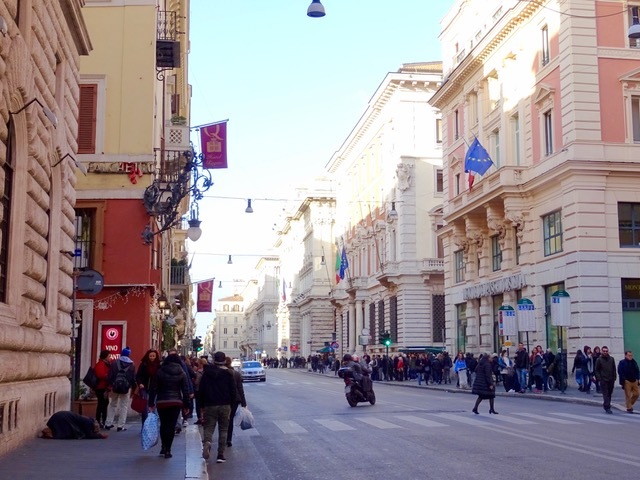 We head down the Via della Concillazione, the wide road that leads to St. Peter’s Square… and across the Ponte Sant’Angelo with a good view of the Castle Sant’ Angelo and the Tiber River. 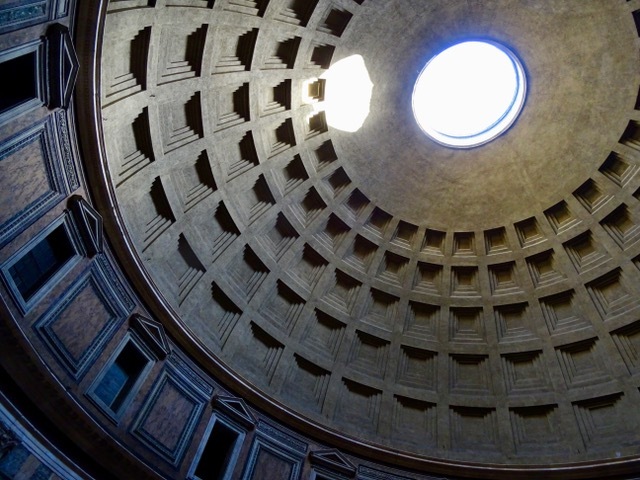 By the way, Romans pronounce it ‘teeber’ not ‘tiber.’ One of the things I love about Rome, eye candy everywhere! 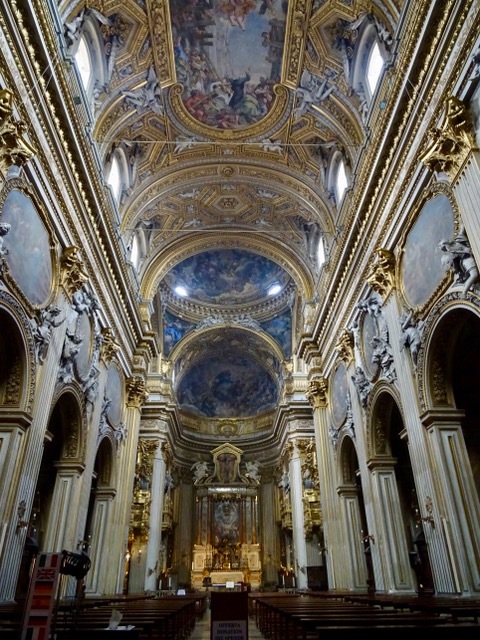 We take a minute to pop into the Church of Santa Maria in Vallicella, known as the Chiesa Nuova, or New Church. A friendly lady comes to chat and gives us an audio guide tour. 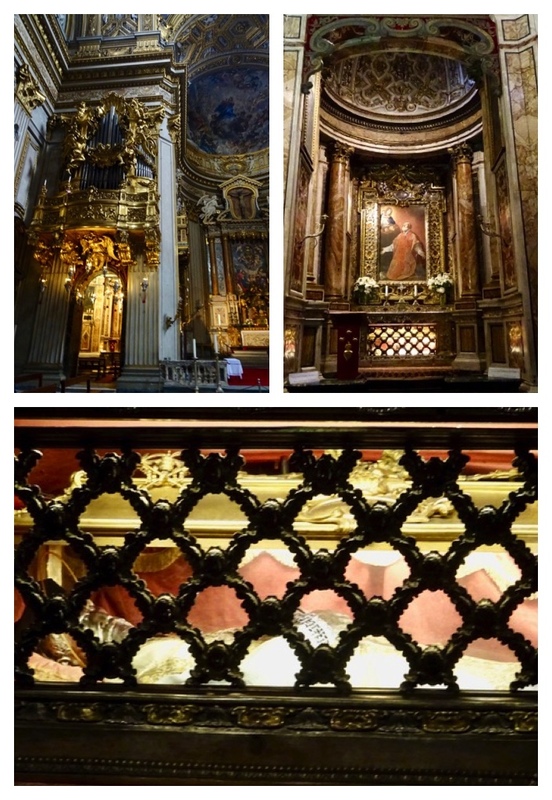 The church celebrates the life and legacy of Saint Philip Neri, and this little side chapel is dedicated to him. He is also entombed there in a glass coffin. It is a bit strange to see so many bodies on display in churches here, it is not something we see at home. 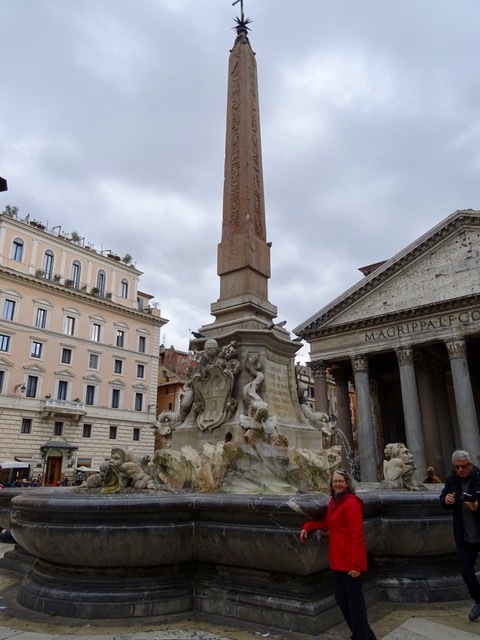 We wander back towards the Pantheon for photo of the obelisk in the centre of the fountain. 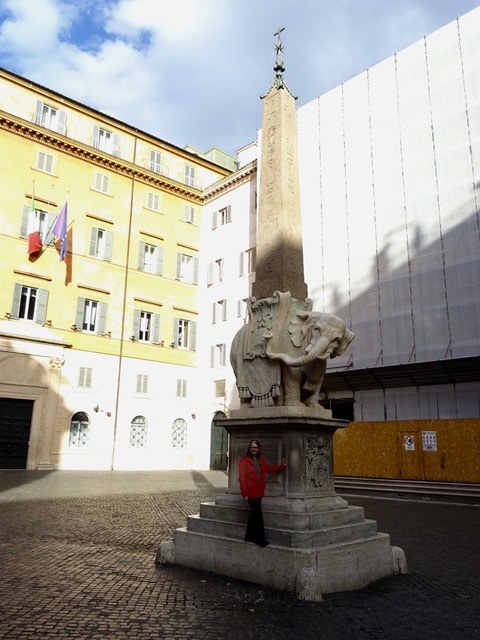 I think we are getting close to seeing all the Egyptian obelisks in Rome. I will have to check, but I do know there is one more near by. 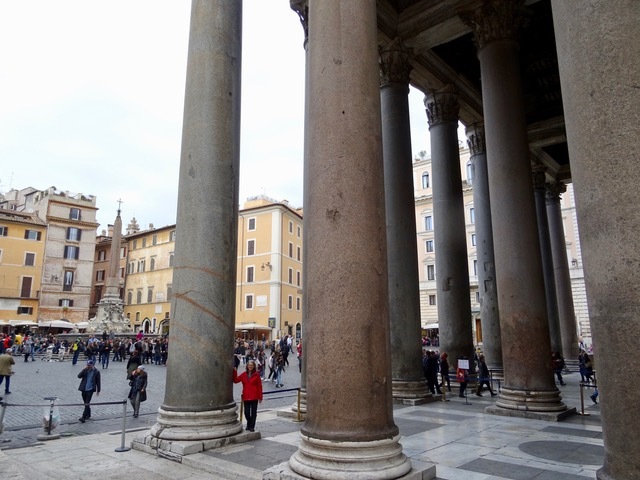 I wanted a photo to show just how enormous the columns at the Pantheon are. Around the corner behind the Pantheon we find one more obelisk. 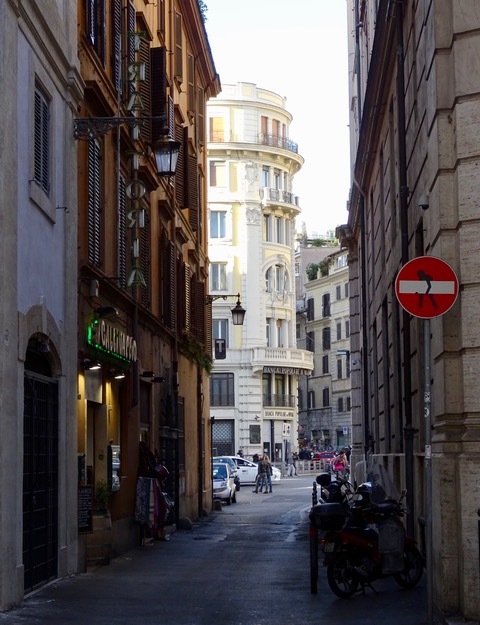 Bernini designed the base for this one after it was discovered in excavations nearby in 1667. Back to the front of the Pantheon where the long line up has disappeared so we go in to see what it looks like in the daytime. The sun is shining through the oculus, but other than that the lighting isn’t much different than during the evening. We take another quick look around and we are on our way. 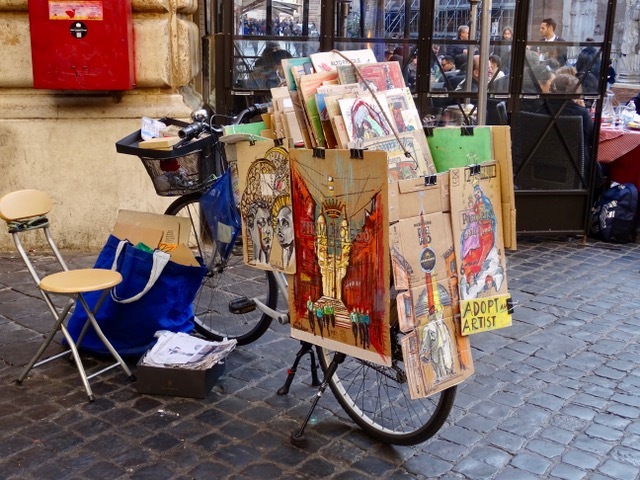 People try to earn money in all sorts of ways in Rome. 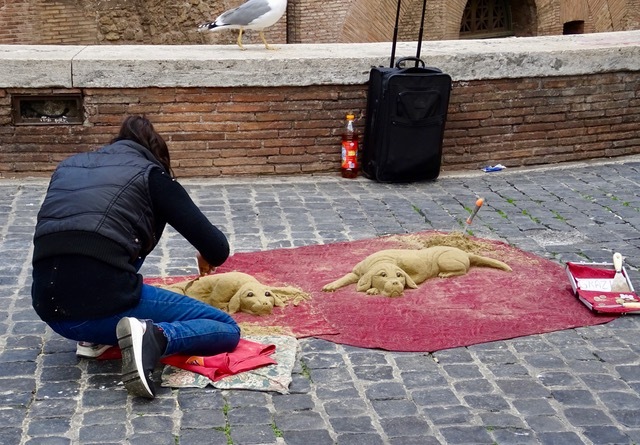 This young woman was sculpting sand puppies… and an artist asks to be adopted, but he was nowhere in sight when we walked by. 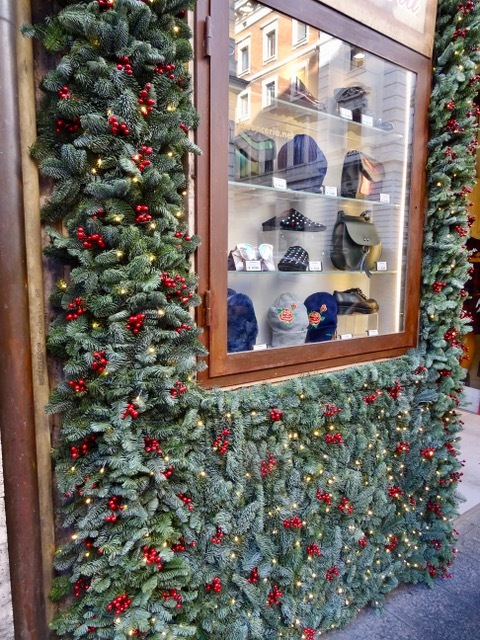 Christmas decorations are making an appearance, and many stores use live evergreens in their decorations. I am curious and a closer look reveals that they are using Oasis, or floral foam, to keep the greens fresh. These displays smell so Christmassy when we walk by. A view down one of the main streets where we wait for our bus. Notice that there aren’t many cars at all. Also notice the gypsy lady prostrated on the sidewalk, begging. I can’t imagine this is an easy way to make money. 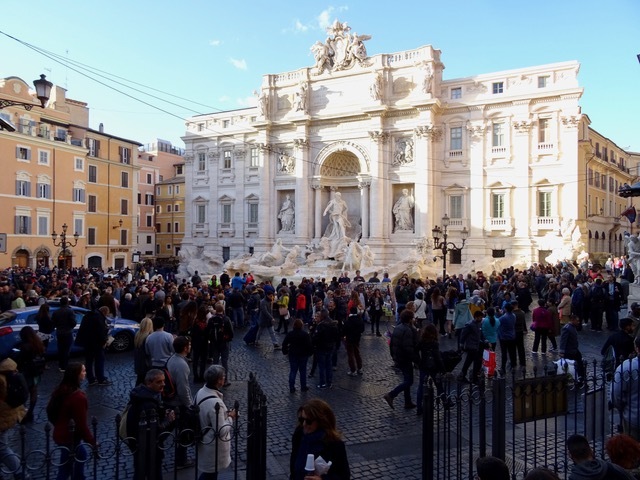 We pass Trevi Fountain with its hordes of people and decide it is time to head home. As you already know, I love looking down side streets and into courtyards. I didn’t even notice the ‘street art’ on the do not enter sign until today when I was posting this. This lovely apartment building with its garden balconies is on the corner near our own apartment. 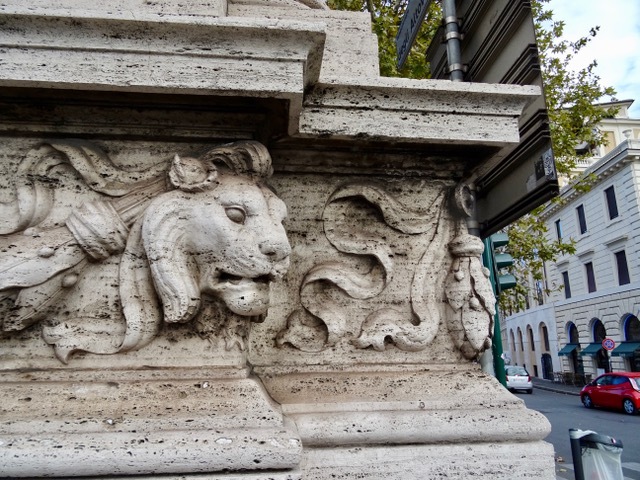 This entry was posted in Cathedrals, Churches, Historic Buildings, Italian Cathedrals, Italian towns, Italy, Monuments, Sculptures, Street Art, The Vatican, Vacation and tagged Chiesa Nuova, Church of Santa Maria in Vallicella, Obelisk on Elephant's Back, Pantheon, Pope Francis, Rome, Saint Philip Neri, St. Peter's Square, The Pope, Trevi Fountain by Trudy. Bookmark the permalink. Wonderful photo of. The POPE! Closest I shall ever get! Goes without saying that the architecture was impressive. Also was pleasantly surprised by the sand puppies & perhaps the artist WAS adopted! Nice apt. Bldg. show us YOURS too. You know, I never took a photo of it. Nothing fancy, a big pinkish building with a nice courtyard. 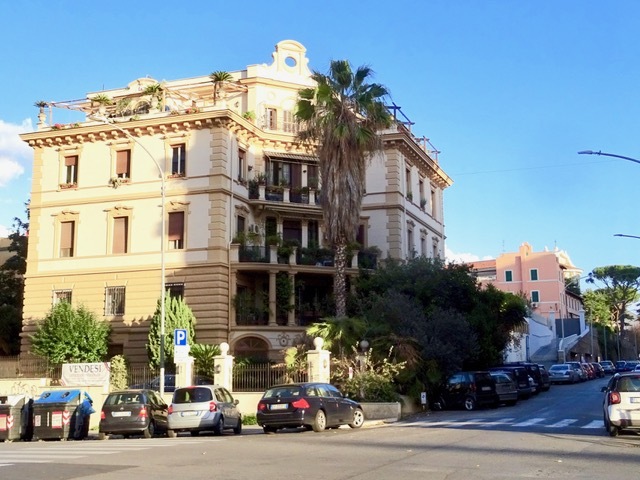 There is a link to our apartment in the blog posting on the first day we arrived in Rome though.Never thought of that, maybe the artist was adopted!